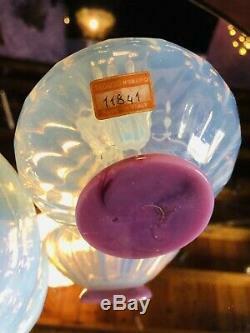 MAGNIFICENTLY HANDCRAFTED ANTIQUE MURANO SEGUSO OPALINE OPALESCENT SHAPELY BOTTLE & BOWL SET. 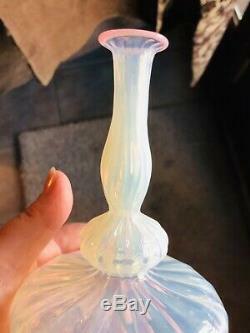 EXCEPTIONAL EXAMPLES OF ANTIQUE VENETIAN OPALESCENT GLASS. 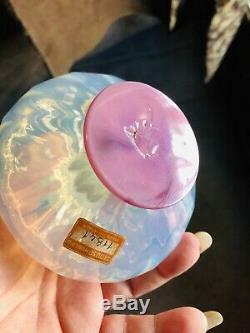 Presenting an exquisite antique Venetian opalescent art glass dresser bottle and bowl, expertly hand crafted by a master Italian glass artist. The quality of these masterfully crafted pieces are evident at first sight. These stunning examples are a matching set with original label still on the bottle reading SEGUSO MURANO made in Italy numbered 11841. 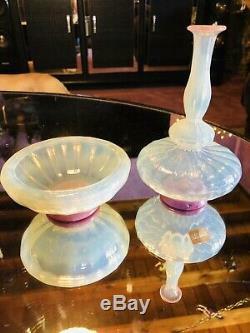 The elegant shape of these 2 pieces are absolutely exquisite hand blown of opalescent glass. 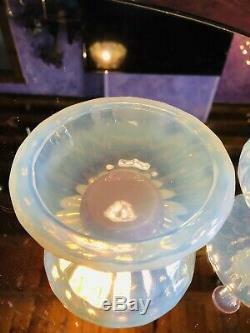 The opalescent glass has a lovely cool opal blue color which is spectacularly illuminated as the light illuminates the form, creating a most spectacular contrast. Magnificent vertical optical ribbing wonderfully accentuates the stunning sparkle of the glass, radiating light throughout the perfectly proportioned unique form while adding a fabulous tactile element to the design. The radiant colored tones and milky opalescence are beautifully enhanced by the ribbing. 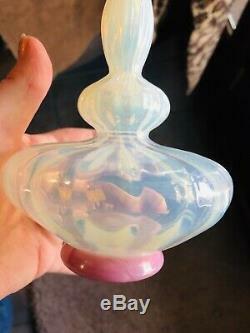 Both pieces have purple bases and the bottle has a dainty ribbon of purple around the flared lip edge. The stunning bottle stands a little over 6 1/2 tall the the most amazing expanded and contracted fluted panels. The matching bowl stands 2 tall by 4 1/2 wide by 2 1/4 deep. Both pieces bear traces of their pontil marks from being blown. The glass stylishly swells and tapers on the bottle to create a wonderfully elegant and perfectly breathtaking form. 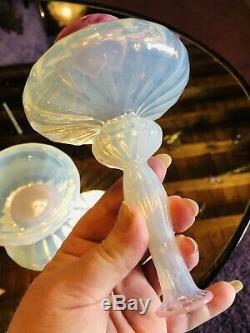 These masterfully crafted pieces look truly exquisite with light illuminating the opalescent glass and optical ribbing. These stunning examples are presented in excellent antique condition with no chips, cracks, breaks or repairs. These pieces have been very well cared for as display items. 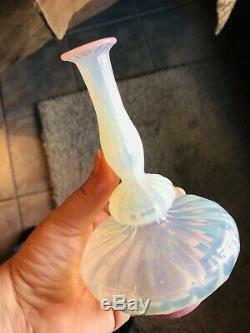 These exquisite pieces would make an outstanding addition to any Murano or quality antique Venetian glass collection. A wonderfully elegant authentically antique feature for any well designed home! A perfect gift idea for the discerning admirer of fine quality, artistically designed and masterfully hand crafted antique objects of sheer beauty! The Seguso family has been dedicated to the art of Murano glass in Venice since May 3, 1397. Seguso is one of the most esteemed, historical and respected glass manufacturers on the island, and among the largest glass furnaces in Murano, which has a few, homonymous furnaces. Glass made by the Seguso furnace can be found in over 75 museums worldwide, such as MOMA in New York and the Victoria and Albert Museum in London. Today, Seguso is known for its high end Venetian glass objects, lighting, accessories and custom installations. Seguso glass has been made for the Pope, Royalty and numerous luxury interiors throughout the world. 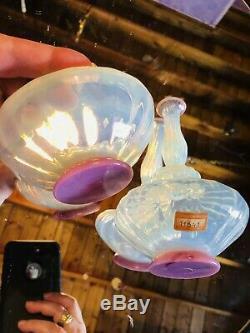 The item "EXQUISITE VICTORIAN VENETIAN MURANO SEGUSO OPALINE OPALESCENT BOTTLE & BOWL SET" is in sale since Thursday, April 11, 2019. This item is in the category "Pottery & Glass\Glass\Art Glass\Italian". 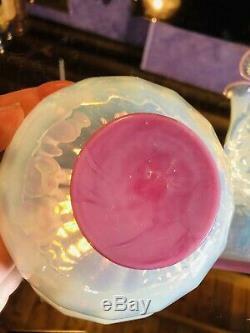 The seller is "stealthers" and is located in Ware, Massachusetts. This item can be shipped worldwide.